The Canadian Government has invited 2,750 candidates to submit an application to seek permanent residence in the Express Entry draw held on Dec. 20th, 2017. The cut-off CRS score for this draw was 446. This is a decline of six points compared to the previous draw, held on Dec. 6th. IRCC used the tie-break rule here where some candidates scoring 446 received ITAs. This means that only the candidates who had scored 446 and had entered their profiles in the pool before a date and time set by the IRCC were eligible to receive ITA. The time and date for this draw was Oct. 2nd , 2017 -14:56:53 UTC. To Improve your chances of success within the Canada Express Entry pool, check your eligibility for Canada Immigation with our free online assessment. This was the 30th draw to be held in 2017, and the total number of ITAs, sent during 2017, stands at 86,023. The number represents 57 percent of the 150,868 ITAs which were issued since Jan 2015, when the Express Entry system was introduced. This draw was held after four draws took place in the first three weeks of November. The draws were a consequence of the announcement by the Government regarding new multi-year immigration plan, which aims to increase the number of candidates for giving permanent residence using the Express Entry system by 20 percent in the next three years. 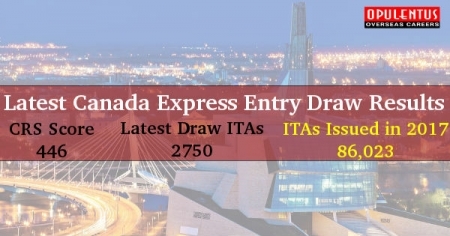 After this announcement was made, six draws were held and 11,045 ITAs were issued totally. The three economic categories have a high ITA target, in the Express Entry system, for 2018. There is an expectation that IRCC needs to perform, large and frequent draws, from the Express Entry pool in the New Year, or resort to both these strategies. Such scenarios will impact in lowering the cut-off CRS score. The candidates who received an ITA in this draw were successful owing to a Master’s degree, and having advanced English language proficiency. For some candidates possessing two post-secondary certificates and a score of 6 in each category in IELTS gave success. The decline in the cut-off score for this draw was not as low as many expected, but 2018 is approaching and it has high admissions targets. Compared with 2016 there is a decline in the cut-off scores in 2017 and the higher targets for the next year point that this trend will continue. To Get More Information Email us at [email protected] or call us 7207111222. One of our experts will meet your expectations and provide answers to queries.